On July 8, 2017, Gerald and I celebrated the life of Parker with a few of our closest family and friends at "Pettibones," a restaurant, bar and banquet located at the Coca-Cola Field. 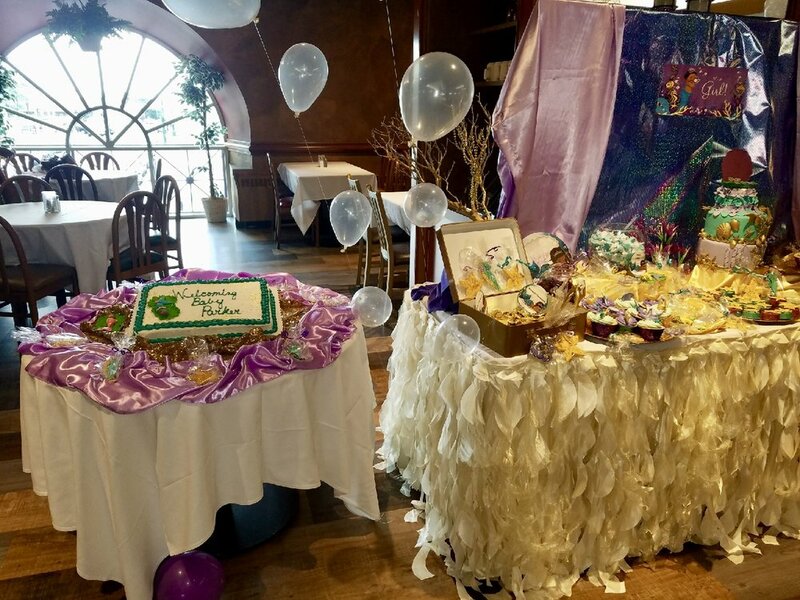 Parkers Grandmother and Aunt worked together to plan the perfect "Under the Sea" themed event. The party favors were a small box filled with Hershey kisses and a tube of bubbles. Parkers grandmother created a deliciously decadent dessert table filled with vanilla cupcakes, sugar cookies, cake pops, chocolate covered Oreos and jars filled with candy. All nicely decorated with mermaid tailed, sea shells, seaweed and starfish to carry the "Under the Sea" vibe. The focal point of the table was a mock three tier cake with gold under the sea embellishments. The top tier of the cake was a real mini vanilla cake that we took home after the shower.